Android operating system has so many awsome features, some of the features are known by many using android device, while some of its features are yet to be discovered by many. Android OS is the most customizable mobile platform as it stands now, and it gives users opportunity to take full control of their devices in some cases. You may think you are more familiar with android os features but, there are lots of features that appeared to be hidden, it only take you being more committed to your android device before you can discover most of its hidden features. Today, I will be unveiling with you, one of its awesome feature and how to make use of it on your Android device. This very feature am sharing with you guys is called screen pinning. I guess all may want to know what screen pinning is all about, before talking of the implementation. So screen pinning is one of the security added features that runs on Andriod 5.0 and above. It enables user to pin just one particular application to the screen. What it means is that, anyone who eventually use your phone will only have access to the pinned app on the screen. This feature becomes very useful when you want to keep your friends out of reach to your other applications or information, as the only access they would get should be on the pinned app. 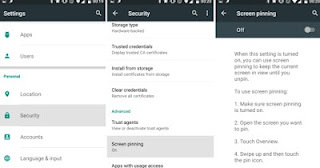 >> First, goto your Android phone settings and click on Security. >> Just scroll down to the bottom, directly under advance, you will see the screen pinning, click on it. >> Next, you will see Switch at the top, just Tap it to enable the screen pinning. Latetest Method On How to Install Mediatek USB Preloader Vcom Port Driver On Windows PC. Addition of Smart Function And Subtraction Of Dangerous Damages To Your Android Device. >> First choose the app you wish to do the screen pinning and open it. >> Now, You should drag the app you wish to pin until it's in the middle of the screen. >> Next, ensure to tap on the blue pin icon which is located at the right bottom position of the app you wish to pin. >> After the above step, now just confirm your action and the app will be pinned to your phone's screen. >> Now, in case you wish to unpin the app, what you need to do is to hold down both the overview and back button simultaneously for a few seconds, And boom! the app in talk would be unpinned. That's all for that, and hope you can now boost of knowing another awesome feature on your smart android phone.A least you can give someone else or a third party your phone being rest assured that your information is safe. If you got anything to ask or share with us, just use the comment box below. And tell us if you pinned any of your app whether it was successful or not?